1. Click SETTINGS at the top > EMAILS on the left > place your mouse over the notification > then hit the PENCIL icon to edit it. 2. 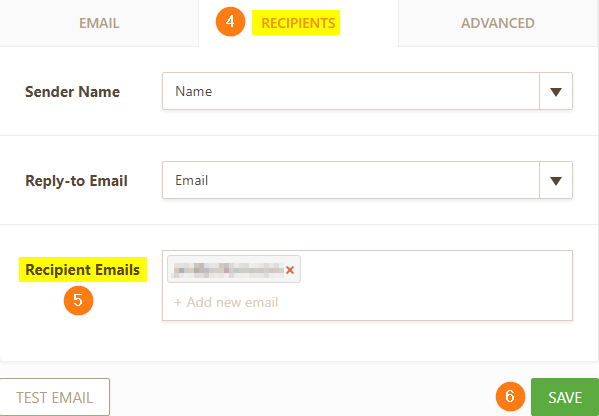 Go to the RECIPIENTS tab > then on the RECIPIENT EMAILS section, add your preferred email addresses. Don't forget to SAVE your changes. NOTE: Multiple recipients is only available to paid users. There's also a limit of 10 recipients per Notification and 2 for Autoresponders. You need to create a new notification if you wish to send it to more than 10 emails. I have set up an Autoresponder email, however when testing the form, the email does not come through to the receipient. How can I fix it? I need to send notification (results) to an email address the guest provided on the form. How do I do that? How many recipients can I include? Which level of paid membership do we need to add an additional email address? yo tengo varios destinatarios pero y a su bandeja de entrada de su correo les esta llegando 4 copias del mismo formulario ¿Por que pasa esto? Are multiple recipients setup as CC'd, or is the email sent directly to each recipient? Multiple emails was available to us until very recently. It is not listed as a "perk" of a paid account. Because we have been using this feature free until now and it is not listed in the pricing section of the website, it would be good customer service to "grandfather" in your clients who have been using this feature without charge for many, many years. It would be most appreciated to have this feature reactivated on our account. I get that part. But I want to make those phone numbers to so those receipts receive a text. I have an order form set up to send notification emails when form submitted. The email is sent on the Test Email. But when an actual form is submitted the notification is not being sent. Also, I have tried to submit this question under the support section on Jotform.com multiple times and it freezes up saying "Please wait..." after the submit button is clicked. I've been on a free account for a while and my form was being emailed (notification) to about 6 people with no issues. Now, I cannot even delete an email address, let alone add a new one. Is it frozen/locked because I now need to pay? Surprised I need to pay to simply remove an email address as a recipient. can I paste the link into a normal email and get the same response information? I am sorry, maybe I was not clear with my question, I would only want to send the submission to 1 email address and then if the button was pressed it would go to an alternate email address but not the regular submission address. We recently went in to change an email recipient as we had 2 when our charity originally signed up. We were able to delete the current on but unable to replace it. I do see that there is a change limiting the # of email notifications now to only 1. Is there anyway to pay a little extra for a second one or be grandfathered in? When I create a test response, I do not receive notifications. Setup seems to be the same as for other forms that work. I need to add 3 email recipients depending on what region a customer is located in. Which plan do I need? When people fill out our form, they have the option to add an additional email address (friend, colleagues, etc.) in order for that extra email person to get the same info. Can we send them both (the person who fill the email and the extra email address) an autoresponse? If so, would it be possible to know how to do it? Hello! I was wondering if there is a way to, when the form is delivered to recipients, have ALL the recipient email addresses appear in the "To" field so that recipients can see who else the notification has been delivered to. This appears to work on some of the forms I use and not others, so I was wondering if this is a setting that can be changed. Thanks! I recently updated an existing jotform (Certificate of Insurance) to notify 5 email recipients. Neither the notifications nor the autoresponder are sending out. Please advise. So, this doesn't seem to work. I've tried it multiple times with different email recipients and the email only goes to the address associated with my account. Even when that email address isn't in the list, it's the only one that receives the email. lately, i found out i did not receive notifications in my email thou we are using our form in jotforms in our daily basis. how this happen or what is the cause of this? I currently have this setup under conditions. One email is going to two recipients. Up until two weeks ago when either of them got the email it showed both emails receiving the form. So both users knew each other got the form. Now recently it is only showing one person so they are thinking the other person didn't receive the form. Any reason why this change? I need for them to both see the recipients of the form. olá, boa tarde equipe jotform a minha dúvida e como dar a opção para o meu cliente selecionar um o departamento(destino) no processo de preenchimento do formulairo. Exemplo: ele preenche o formulário e antes dele enviar a mensagem ele seleciona o departamento para onde o e-mail vai, em que caixa de entrada. Hi. When sending to multiple receipients I would like them to be able to see who else has received the e-mail. Now it seems that it sends one individual email to each recipient? I create a mail list but i want that the recipient is in hide copy. All recipient see only his email. It's possible? My emails are not going to an office 365 email account. I have followed the steps described in the "Send Notifications to Multiple Recipients" because I need to send the notification to 2 different recipients, but for some reason the notification keep being sent to just one, the one that I have used for registration ... Any idea how to solve this problem? Many thanks in advance. I want to send forms to 90 contacts. after 10 contacts it is showing "you have reached the limit". What is the solution? Hi! I have two forms that I need to use at the same time, how can I use a form with a notification email address and the otherone with other email address?? can I do it by this way? I need a permanent form and the other form is for two weeks. I have multiple email recipients and have checked the email addresses for accuracy and set up. No one is getting the test email. The email is being sent to the default email which would be me. How can I correct this? It only seems to be sending to the last email recipient for me. I've carefully checked that there is only one comma and space between the email addresses. Also when I click the view answer above it throws me back to my list of forms? Any help would be appreciated as we are using these forms in production and notifcations are not going to everyone! I am following the instructions but everytime I send a test email from the website or here, it only comes to one email recipient.. It does not let me type in the Recipient Email box, it just gives me a dropdown box of fields from the form.. I want to use the email the client specified in the form, but also add our CRM system into the email..
Also, will this create two emails, or one with both names in the to field? Doesn't work for me, i receive email when a submission is done but not the on 2nd email address i choose to receive it. i need to send notification to 15 recipients, as per selection of responder. i already made many email alerts, but the condition wizards is limiting me to only up to 4 conditions. why is that so? how can i send notifications to 15 recipients as per selections? How can I add two email addresses with condition that messages will come to them in the order (first message - to emal-1, second - to email-2, third - to email-1, fourth - to email-2... and so on). I've tried this and added two email addresses but it still tells me that the form was submitted to the address I had deleted! I still have not received any of these submissions. Please help. I am Kristy,how are you? hope you are fine and in perfect condition of health.I went through your profile today and i read it and pick interest in it,if you don't mind i will like you to write me on this ID (kristy4vaye@hotmail.com)hope to hear from you soon,I will be waiting for your mail because i have something VERY important to tell you. Lots of love Kristy! can i insert gmail addresses to recipients? How many conditional email rules can i have per form? Will autoresponder send the email whatever email gets entered into the field? Is there a restriction on conditional email recipients? How can I add a recipient email ID to my auto responder email?